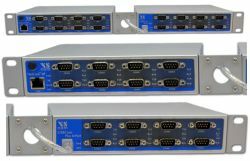 Serial Device Servers with 8 ports as RS232 or RS232/422/485 (three way) operation. The operation mode is easily configured as common mode by DIP switch, or individually by software. Communication via WLAN is also supported. The special model NetCom Plus 811 DIO additonally provides 8 Digital Input and 8 Digital Output signals. The supply via POE is implemented here as well. The USB-COM Plus modules can extend the number of ports. This way 12 or 16 serial ports are easy achieved.